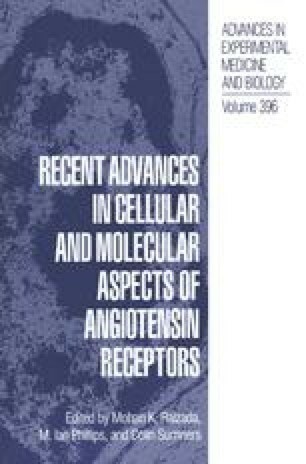 The peptide hormone angiotensin II (AII), the biologically active component of the renin-angiotensin system, exerts a wide variety of physiological effects on the cardiovascular, endocrine and central and peripheral nervous system (1). AII exerts its physiological effects in the target tissues through specific interactions with plasma membrane receptors (2). Given the diversity of AII-mediated events and the differential signal transduction mechanisms, it has been proposed that multiple AII receptor subtypes exist (3,4).